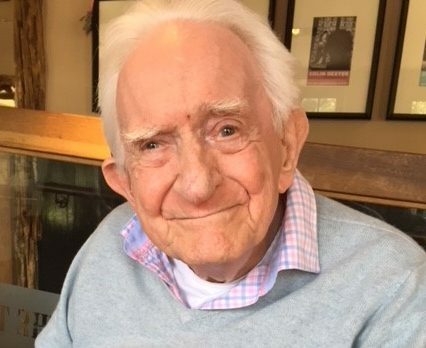 My husband, Sir Brian Tovey, was diagnosed with various symptoms of dementia which began about three years before he died in December 2015 aged 89. He had a number of other age-related ailments, including becoming less mobile because of a knee replacement. We moved to Oxford from London in 2010 and, although he was very partially sighted – only had limited vision in one eye – he was still managing to work and spend a few hours every day in the Sackler Library here in Oxford. In 2012 however his sight deteriorated and he was unable to read or write – from that point on symptoms of dementia began to appear – inability to process language: the spoken word or finding vocabulary. He was very good at covering up his lack of ability. He was diagnosed at the John Radcliffe Hospital in the Lionel Cosin Ward (the Memory Clinic) in 2014 with vascular dementia. With all Brian’s other diseases, I found myself under enormous pressure to maintain a semblance of some quality of life. While at the hospital we were introduced to a lady from Age UK who had a room in that Ward; she gave us various leaflets abut coping with dementia and she mentioned “Daybreak”, a charity which she thought we might find helpful, especially as we lived fairly close to one of their Centres in Oxford. Daybreak was a revelation, somewhere where I could take my dearest and leave him to the wonderful care of the Manager (Julia, and her two assistants, Sue and Christine – since Julia left about a year ago, Jitka has taken over as Manager). I must admit to having a few tears as I walked away from the Limes that first day I left him, like leaving a child on their first day at school. But I was so grateful that I could leave Brian in very capable hands – in a very welcoming environment – and have a few hours to myself to get my hair done, do some essential shopping, visit the bank, etc., without worrying. Daybreak provides stimulation for its members in many different forms, puzzles, jigsaws, music, poetry, singing, floor games and a hot meal; a forum where the members meet new friends, have some stimulation, be treated as a normal responsive human being, even though their sensory abilities are, in some cases, very much impaired. And there is a lot of laughter! There is another aspect which I have found immensely supportive and, since my husband’s death in 2015, a very important development in my life – that is the coffee group formed by the spouses of the members. We meet at the pub next door to the Limes, the Anchor, on a Tuesday morning and comfort and support each other, as well as sharing information and having lots of good humour. We have a WhatsApp group and are in daily communication with each other about a multitude of topics – dealing with the Council, the medical profession, lawyers, etc. etc., and lighthearted spur of the moment thoughts and fun comments. Daybreak has been a life saver and I honestly don’t know what I would have done without it. I am a volunteer and a Trustee now.